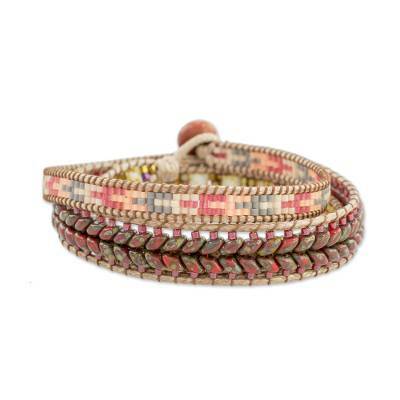 This eternal wrap bracelet from Guatemala is presented by Cristobal Ramirez. 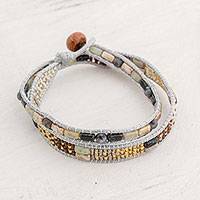 Petite glass beads in tones of grey, peach, and pink decorate the bracelet, resulting in a soft beauty. 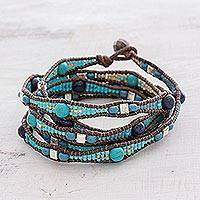 The beads are strung between two lengths of slate cord that circle the wrist several times. This accessory closes with an aventurine gemstone button. "My path in life hasn't been easy, but I know that God’s purpose is bigger than the adversities I’ve experienced." 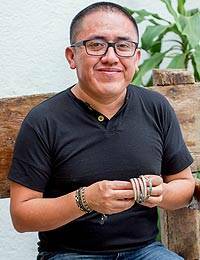 "I was born near Lake Atitlan in 1971. 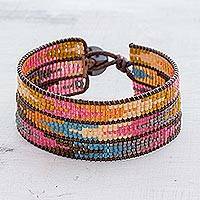 I design and create beaded, crocheted and macramé bracelets, which I began learning to craft when I was seven years old. When I was 11, I began creating techniques and designs of my own and sold them in villages along the shore. Little by little, I created more styles. 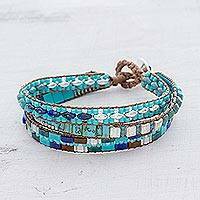 "To obtain materials, I'd ask people who were going to Guatemala City if they'd do me a favor and buy me beads and such while they were there. "While we didn't have luxuries, everything went well for us and I always had what I needed, thanks to my mom. “When I was 17, a terrible civil war broke out in Guatemala. Amid the armed conflict, my mother was killed and I was sexually assaulted. I became the head of my family, and took on the responsibility of my three brothers. Even so, I felt devastated, with little desire to go on in life. "By the time I was 21, I took up my handicrafts once more and, thank God, I felt like I was in control of my life again. "As time went by, I gained a lot of clients, but then tragedy struck again. When I was 33, I lost my home, then one of my business partners was kidnapped and held for ransom. He was released but the money was never recovered. It was so hard to move past this. But I've always been confident about my abilities and, with God's help, my workshop has given me my greatest happiness and satisfaction. Everything in life is better if you walk hand in hand with God and with your family supporting you. "My path in life hasn't been easy, but I know that God's purpose is bigger than the adversities I've experienced. I have managed to prosper despite the beginning being a roller coaster of emotions because I didn't know if it would work out or not. "Setting up a workshop was my biggest adventure because I didn't have any funding. However, many people trusted me and wanted to work with me. It's been a pleasure to teach them, so that they can have a secure income. I'm so happy to know that some families have been able to build their own homes, send their children to school and have a dignified life. "What I most enjoy is that this art has a spirit of freedom because it isn't limiting. I can express myself through designs and colors, and they never go out of style. "My dream is to see my children graduate from the university. I want to see my community prosper and I hope to be a stepping-stone for hardworking people. Together, we'll continue this craft so they have the possibility of imagining and creating the wonderful designs that highlight a woman's beauty." This item was handmade in Central America by NOVICA artisan borrowers. Kiva lenders have helped these artisans stock up on materials, buy more tools and grow their businesses.